Deer with Chronic Wasting Disease. Image: Terry Kreeger, Wyoming Game and Fish and Chronic Wasting Disease Alliance. A public health scientist recently warned Minnesota legislators that chronic wasting disease in deer may soon spread to humans. Dr. Michael Osterholm, director of the Center for Infectious Disease Research and Policy, asked the lawmakers for funding to develop a more advanced and timely chronic wasting disease test. Such a test will make the human consumption of disease-infected deer less likely, he said. “It is probable that human cases of chronic wasting disease associated with consumption of chronic wasting disease contaminated meat will be documented in years ahead,” Osterholm said. Chronic wasting disease attacks the brains of deer, according to the Centers for Disease Control and Prevention. It is spread through contact and causes drastic weight loss and lack of coordination. Stricken deer also do not fear people. As of March 6, the disease has been found in two provinces in Canada and 24 states in the United States, including Minnesota, Michigan, Illinois, Wisconsin, Pennsylvania and New York, according to the Centers for Disease Control and Prevention. “It’s possible the number of human cases will be substantial, and will not be isolated events,” Osterholm said. Not everyone agrees. There’s a lot of mixed information when it comes to the topic of chronic wasting disease spreading to humans, according to Matt Dunfee, director of the Chronic Wasting Disease Alliance, a group that promotes responsible communication about chronic wasting disease. “To date, no evidence indicates that humans are susceptible to chronic wasting disease and there appears to be a good species barrier,” Dunfee said. This means the disease isn’t likely to spread to new species. But the same was said about mad cow disease, Osterholm said. “To claim that there hasn’t yet been transmission tells us little,” Osterholm said. He compared chronic wasting disease to mad cow disease, which took 10 years for human cases to appear after it first appeared in cattle in Great Britain. It comes from the same family of diseases as chronic wasting disease, Osterholm said. That’s why the science community is concerned. Although models have shown that chronic wasting disease could jump species as mad cow disease did, that still doesn’t tell us much, said Bryan Richards, emerging disease coordinator at the University of Wisconsin-Madison. 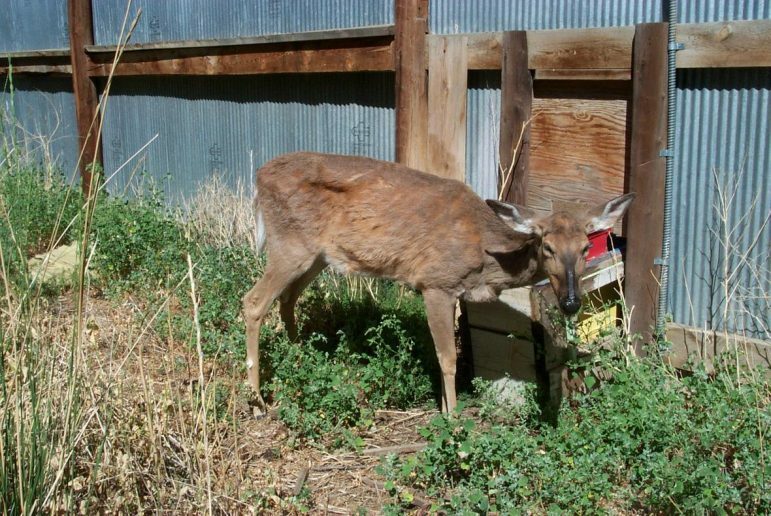 How can you minimize the risk of contracting chronic wasting disease? The Centers for Disease Control and Prevention suggest not handling or eating deer or elk that are acting strange or look sick. It also advises hunters to wear gloves when handling dead animals and to check state and wildlife public guidelines to see if testing animals for chronic wasting disease is recommended or required in your area. Regardless if people will contract chronic wasting disease, scientists agree that the public needs to be educated on how to slow the spread. The disease is likely spreading into new areas because of humans, said Kelly Straka, state wildlife veterinarian for the Michigan Department of Natural Resources. Humans dispose of carcasses and bring live infected animals into unaffected areas, which accelerates the expansion. The disease also likely exists undetected in some states, Straka said. Because we can’t test live animals, the disease is hard to track. This puts states like Ohio and Indiana, which border contaminated states, at a high risk of unknowingly housing infected herds.